The struggle in Catalonia for self determination has shaken the whole Spanish state. It has forced all political forces to take a stance. Much of the left across the Spanish state, while not supporting the repression of the right-wing government of Prime Minister Mariano Rajoy, have also not supported Catalonia’s independence process. 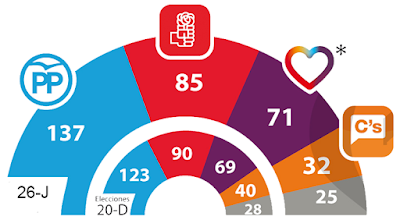 The Spanish and European establishments have just days to stop the advance of the progressive electoral alliance United We Can in the June 26 general elections in the Spanish state. How are they doing? As matters stand, not well. United We Can, formed in early May, brings together new anti-austerity party Podemos and the longer-standing United Left (IU), as well as broader coalitions in Catalonia (Together We Can), Galicia (In Tide) and Valencia (A La Valenciana). Spain: Can left's economic plan reverse austerity? United We Can — the united ticket made up of Podemos, the United Left, the green party Equo and three broader alliances in Catalonia, Galicia and the Valencian Country — is campaigning in the June 26 Spanish general elections on a plan to reverse economic austerity. Spain: With Podemos and United Left joining forces, is a left government in sight? United Left's Alberto Garzon and Podemos' Pablo Iglesias. Five months after the December 20 election in Spain failed to produce a government, the country is returning to the polls in the most polarised contest since the end of the Franco dictatorship in 1977. 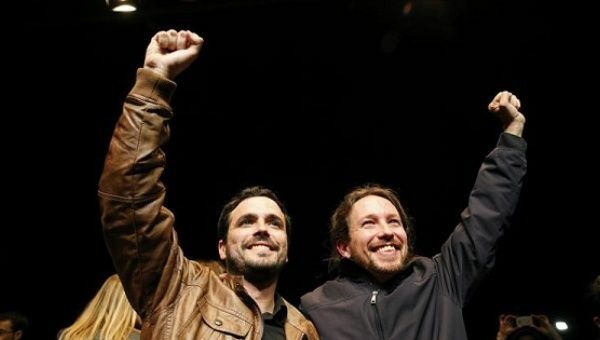 United Left leader Alberto Garzon and Podemos leader Pablo Iglesias celebrating the formation of an alliance between the two parties. Spain's anti-austerity party Podemos and older left-wing party United Left announced on May 9 that they had reached a preliminary agreement to run on a joint platform before Spain's new general election on June 26. What was the central message of the December 20 Spanish general elections, which was “won” by the governing conservative People's Party (PP) of Prime Minister Mariano Rajoy with only 28.72% of the vote, 3.6 million votes less than the last national poll in 2011? Why did the opposition Spanish Socialist Workers Party (PSOE) greet its worst ever result —22.01%, 1.4 million votes less than 2011 — with a sigh of relief? The December 20 elections in the Spanish state will attract the usual large field of runners. Challengers will represent every imaginable position along the Spanish state's two main political dimensions — the left-to-right social axis and the axis of national rights. This second dimension reaches from the centralism of the ruling People's Party (PP) to the pro-independence stance of various Catalan, Basque and Galician parties.